KRYTAR, Inc. has debuted a new Directional Coupler that is specifically designed for thermal vacuum environmental applications operating over the frequency range of 2.0 to 8.6 GHz. KRYTAR’s new directional coupler is uniquely designed for thermal vacuum environmental applications where external leveling, precise monitoring, signal mixing or swept transmission and reflection measurements are required. These couplers undergo additional reliability and quality assurance inspections during all phases of assembly and electrical evaluation. KRYTAR’s successful space-application heritage offers distinct qualities including: innovative products; quick-reaction capability; design responsiveness; flexibility; fast production turn-around; and close partnerships with customers. 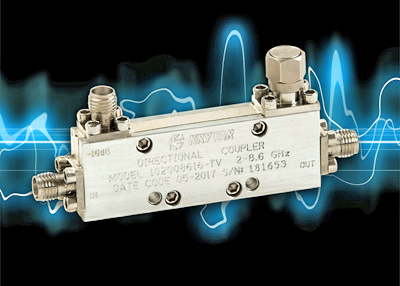 KRYTAR’s new directional coupler, Model 102008616TV, adds to the Company’s growing family of space-qualified directional couplers by offering superior performance over the frequency range from 2.0 to 8.6 GHz. The company’s technological advances provide operating performance of this new stripline design unit. Model 102008616TV delivers 16 dB (±1.0 dB) of Nominal Coupling (with respect to output) and Frequency Sensitivity of ±0.25 dB. Directivity is >20 dB. The coupler exhibits Insertion Loss of <0.5 dB across the full frequency range including coupled power. Maximum VSWR at any port is 1.3, Input Power Rating is 50 Watts Average and 3 KW Peak. Operating Temperature is -54 degrees C to +85 degrees C.
This new directional coupler measures only 2.13 inches (L) x 0.40 inches (W) x 0.73 inches (H). With the standard SMA female connectors the coupler weighs just 1.2 ounces.